Author & Illustrator Nick Sharratt is coming to Scunthorpe on Thursday 22nd February 2018. Nick will be performing his much loved Big Draw Along session for families at Frederick Gough School in the evening from 6.30pm to 7.30pm. 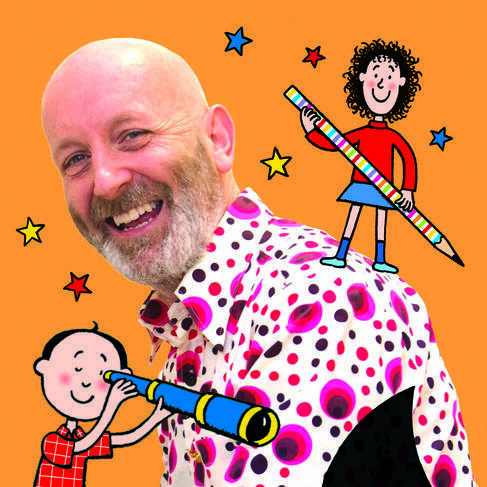 Join acclaimed children’s writer and illustrator Nick Sharratt to find out how he creates his picture books. You will have lots of fun as he shows you how to draw some of his well known characters, such as Tracy Beaker and Timothy Pope, Kings and Cats and all kinds of crazy creatures. Plus he’ll share some of his very best drawing tips. Bring your own pencils, sketch pad or paper and something to lean on and expect plenty of chances to join in! He’s also the proud recipient of a gold Blue Peter badge. There will also be the opportunity to purchase Nick Sharratt books and have them signed.